What are the best protein sources for dogs? In a word, they are protein-rich foods that are the most digestible. 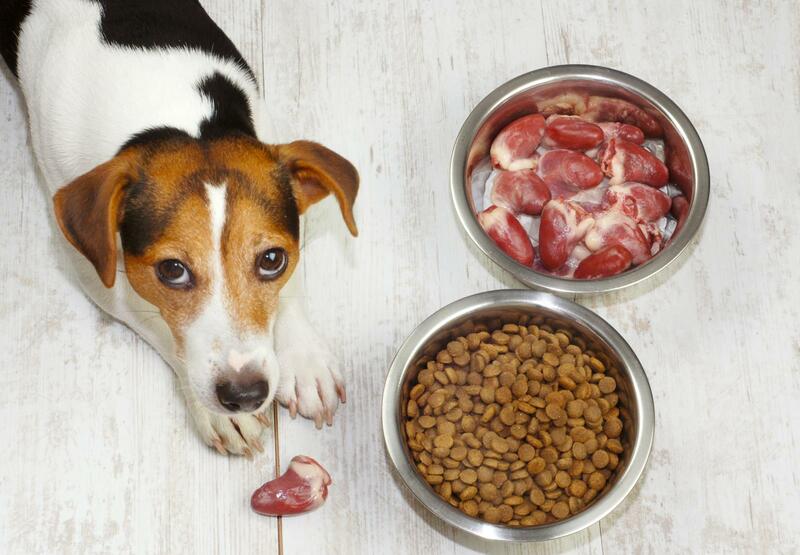 Dogs may be omnivores, but some foods provide more usable protein for them than others. Learn the difference. Dogs may be omnivores, but they rely heavily on protein to help them survive and thrive. Protein contains essential amino acids that are crucial to the process of cell production. Without enough protein in their diet, dogs can develop a host of health problems. They'll lose energy, their coats will become dull and lifeless, and their immune systems become less capable of fighting off disease. "Biological value" is a term used to describe how easily dogs can render the available protein from a particular food source and absorb it into their systems. Foods that have a high biological value are the best protein sources for dogs because they are the easiest to digest. When the food is thoroughly digested, the dog gains as much of the available protein as possible. Foods that contain a lot of protein yet have a low biological value are not easily digested by dogs, and so they aren't a good source of protein. There are hundreds of dog food formulas available on the market, including a number of high protein dog food options. The best brands use protein sources with a high biological value while the worst base their formulas on low biological value foods. There is also a range of foods in between that include both high and low biological value foods. Why such a difference? High-value protein sources often cost more, while low-value proteins are cheaper, more cost effective and still meet pet food guidelines for minimum protein content even though a dog can't digest the food well enough to absorb the protein that is in it. With this in mind, compare the following protein sources commonly found in a wide variety of commercial dog foods. Eggs may not immediately come to mind when considering the best protein sources for dogs, but they are an excellent source of protein and are included in some dog food formulas and many homemade diets. You may even be surprised to learn that eggs are a better source of protein than meat since a dog can render more protein from them as long as they are cooked. When it comes to feeding fish to a pet, most people tend to think of cats. However, fish also provides an excellent source of protein for dogs as long as it is cooked. Many prominent dog food brands offer formulas that contain fish or fish meal, and salmon is usually the fish of choice since it is high in omega-3 fatty acid. You'll see numerous ingredients listed on a dog food label, and it's sometimes difficult to determine exactly what some of those terms really mean. However, there's no mistaking a real, named meat when you read it. 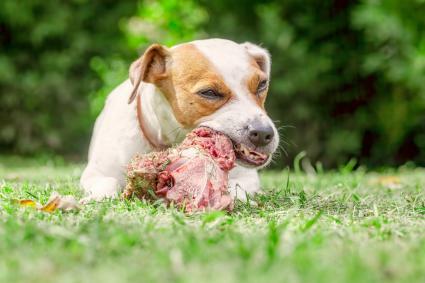 Real meat is the most natural source of protein a dog can consume; it's what his digestive system was designed to eat as evidenced by his wild ancestors. There seems to be a bit of confusion over whether meat meal is a good source of protein for dogs. To be clear, meat meal is not the same thing as a meat by-product. Meat meal is real meat that has been dried and pulverized into a gritty powder. Removing both the water and fat from the meat leaves a very concentrated source of protein that is added to a dog food formula to boost the protein content. Meat meal is actually very digestible, and this means a dog can render more nutrition from it than from an inferior source of protein. The more efficiently a dog can digest his food, the less waste he produces. Although you won't find an overwhelming number of dog food brands that include cheese in their formulas, it is a very viable source of protein for canines. While regular cheese and cottage cheese both contain protein, they contain different amounts of fat. If you have a dog that could use a lower fat diet, cottage cheese is the better choice. Meat by-products are what's left of a carcass after the main meat has been stripped from an animal. Although there is some protein to be found in these leftovers, they are generally much less digestible for a dog. He can consume them, but the protein will pass through his system largely undigested and simply contribute to a larger volume of stool. It's true that you can feed a dog corn or wheat and he'll render a little protein from these foods, but the protein in these grains are very difficult for dogs to digest. This means brands that use corn, cornmeal, wheat, and wheat gluten as main protein sources technically meet industry standards for protein content. However, they cannot actually deliver all the protein promised because dogs can't digest these foods efficiently. A good deal of the protein passes right through the dog's system unused. Some proteins are easier than others for dogs to digest. The sources with the highest digestibility are eggs (100%) and chicken, beef and lamb (92%), which are all meats taken from muscle. Proteins derived from organs, such as kidney, heart, and liver, are next with a digestibility of 90%. Fish, while still a good source of protein, has a digestibility of 75%. The lowest digestible protein sources are plant-based, ranging from 54 to 75%. A dog needs about one gram of protein per pound of weight a day. However, when calculating this formula, the weight should be based on what their weight should be. Using an overweight dog's current weight will give you a result that is too high. For example, if you have a Pomeranian who should be seven pounds, he would need seven grams of protein per day. If your Pomeranian is overweight at eleven pounds, he would still need seven grams as protein as you are using his "ideal" weight and not the weight he is at the time of your calculations. Keep in mind, too much protein won't hurt your dog assuming they are healthy and have no medical conditions. According to PetMD excess protein will be processed by the kidneys and will not harm a dog. However, dogs on a high protein diet should have their BUN (blood urea nitrogen) levels regularly checked to make sure they don't reach 75 or more. The daily protein needs of puppies differ from an adult dog as they require more protein to facilitate their rapid growth. If you compare a diet of an adult dog and a puppy, the adult dog should get about 18% protein and 9 to 15% fat, whereas a puppy should get approximately 28% protein and 17% fat. Higher protein diets may be a problem with larger/giant breed dogs so it's best to discuss your food choices with your veterinarian to make sure your puppy is getting the correct amount of protein. Nature's Variety Instinct Ultimate Protein - Chicken is recommended by PetFoodReviewer and gets four out of five stars from reviewers on Amazon. The food contains 47% protein and 17% fat. A 20-pound bag is about $80. 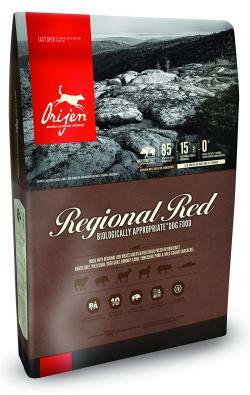 Orijen Regional Red has 38% protein, 18% fat and 75% of the ingredients are derived from high-quality meat sources. The dog food company is the recipient of several rewards for their biologically appropriate food. A 25-pound bag is about $100. Solid Gold Barking at the Moon High Protein Duck, Peas & Egg Recipe Grain Free dog food gets five-star reviews from Chewy.com users. A 22-pound bag is about $55 and contains 38% protein and 18% fat. In addition to feeding a kibble derived from high-quality protein sources, you can add more protein to your dog's diet by supplementing his meals. Add a raw or scrambled egg to his meals. If you scramble the eggs, add a very minimal amount of butter or cooking spray. You can also provide them soft or hard-boiled. Canned fish such as sardines, salmon, and mackerel mixed in with your dog's kibble are also good sources of protein and an extra treat. Fresh meat, such as some cooked chicken or organ meats, are also excellent protein sources. A newer product on the market is protein powder, or whey powder, to build up a dog's muscle mass. It's similar to the product humans use to body build. While these products say they are designed for dogs, whey protein is not recommended for dogs. It is protein but derived from milk and wheat sources that are not designed for a dog's digestive system. Some higher protein dog food choices contain whey protein which should be avoided in favor of better quality protein sources. For some dogs, a high protein diet should be avoided as it will exacerbate a serious medical condition. Some dogs can be allergic to certain protein choices and may have to switch to a different protein source or a lower protein diet. Dogs with kidney and liver disorders should never be on a higher protein diet as this will cause additional stress to their organs. Dogs with hyperactivity issues may do better on a lower protein diet as well. With a clear understanding of just how digestible and, therefore, more nutritionally valuable a particular source of protein can be, check the ingredients label on your own dog's food. Those ingredients are listed by volume from highest to lowest, and those first five ingredients are often the most important because they list the type of protein used as the main component of the formula. Regardless of its reputation or marketing, does your current brand use high value or low-value protein sources? Depending on what you see, you can either continue to feed your dog that brand with confidence or decide it's time to look for a healthier brand.